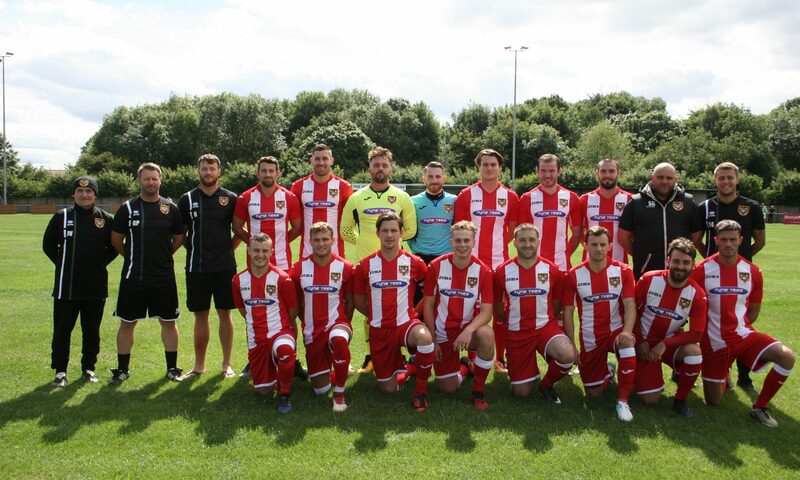 Ryhope CW bounced back after recent poor form to achieve a 3-1 derby win away to Seaham Red Star. Seaham Started very brightly and put immediate pressure on Ryhope, David Robinson’s lob flying narrowly over the crossbar and another effort from the same player having to be tipped over the crossbar by Joe Atkinson. However, Ryhope took the lead thanks to some good play down the left side from Matty Weirs and Robbie Bird, the latter squared to Micky Rae, the ‘keeper equal to his shot but helpless to debutant Jack Devlin’s effort from the rebound. After the goal both teams pushed hard and had good attacks. Ryhope were getting a lot joy down the right hand side, but the crosses were rarely finding their man. Ben Riding’s header from a corner had to be cleared off the line, and Devlin’s header from a good Weirs cross was straight at the ‘keeper. Devlin missed a golden chance in the 33rd minute, Bird latching onto a through ball and finding Devlin who sliced wide of the goal. In the 37th, Michael Chilton converted a rebound after an initial Dan Wilson effort, sending the ball into the goal to equalise. Seaham took control of the following reminder of the first half, Danni Lay was shown two yellow cards in quick succession and was given his marching orders. Red Star piled on the pressure early in the second-half, but Atkinson was equal to everything they had to offer. In the 56th minute Bird was tripped by Anthony Myers in the box when he was through on goal. A penalty was awarded for Ryhope and Myers was sent off, Weirs sent the penalty kick to the bottom right corner which gave Colliery Welfare the lead 2-1. Nathaniel Skidmore scored the third goal for Ryhope in 71st minute after recieving the ball from Rae on the edge of the box and firing low into the bottom left corner. Ryhope had plenty more chances to extend their lead, Bird and Rae missing great opportunities. Post-match, manager Gary Pearson said: “We said beforehand, any team that’s below you, you need to be taking three points from. “In a derby day like today, that Stuey classed as a six pointer, if we’d got beat today I think we’d have found ourself in the bottom five.